Mon., Sept. 11, 2017, 7:02 p.m.
A sculpture commemorating firefighters who died in the Sept. 11 attacks received a permanent home at the new fire station at at 6564 N. Atlas Road on Saturday. The Coeur d’Alene Arts Commission dedicated the piece “Twin Towers,” which was created by Oklahoma artist Robert Stone at an open house this weekend. The piece was purchased by the city and moved from its previous location in Coeur d’Alene City Park. 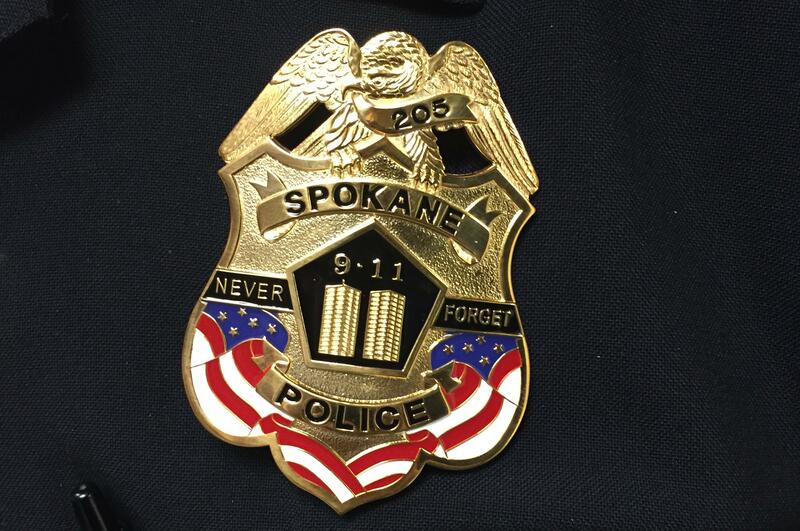 More than 100 members of the Spokane Police Department are donning commemorative badges this month honoring law enforcement killed in the Sept. 11 attacks. Individual department members used their own money to buy the $87 badges, which feature the American flag and the image of the Twin Towers framed by the phrase “Never forget.” A portion of the sale money – $2,320 – was donated by the department to the nonprofit Behind the Badge. The commemorative badges were first proposed by Spokane Police Officer Tim Ottmar, said Major Kevin King. Police Chief Craig Meidl has authorized the department to wear the badges for the entire month of September. In total, 412 emergency workers died responding to the collapsing World Trade Center on Sept. 11, 2001. That number does not include many more who were sickened by the toxic debris thrown into the air above Manhattan when the towers fall, said Spokane Fire Chief Brian Schaeffer. The fire department has been wearing T-shirts for about a decade commemorating the heroics of the 343 firefighters who were among the first responders killed that day, Schaeffer said. Those shirts have the acronym “FDNY” on the back, along with a crest on the arm with an image of the towers and the date 9-11-2001 above the Manhattan skyline. The money raised by the police department will go toward upkeep of the Washington State Law Enforcement Memorial in Olympia, one of the charges of the Behind the Badge nonprofit, said Katie Northway, the group’s Eastern Washington representative. The agency also assists the families of law enforcement officers seriously injured or killed in the line of duty. “We were just incredibly thankful. Our group is mostly funded through donations, and we want to be able and turn around as positively as we possibly can,” Northway said. Spokane police will be able to wear the badges for the month of September in future years, King said. Published: Sept. 11, 2017, 7:02 p.m.